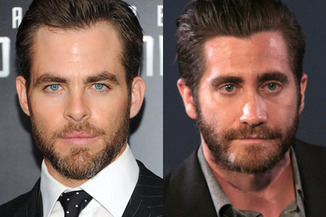 The Hollywood Reporter says that Chris Pine and Jake Gyllenhaal are in talks to join Johnny Depp and Meryl Streep in director Rob Marshall's adaptation of the Broadway musical Into the Woods. With music and lyrics by Stephen Sondheim and book and direction by James Lapine, "Into the Woods" earned 10 nominations at the 1988 Tony Awards, winning three including best score and best book of a musical. The 2002 Broadway revival won a Tony for best revival of a musical. According to the trade, Gyllenhaal and Pine would play the musical's two princes, Cinderella’s Prince and Rapunzel's Prince, brothers who are pompous and self-absorbed. Walt Disney Pictures is expected to start filming in August. James Lapine wrote the script for the film, which is produced by John DeLuca.